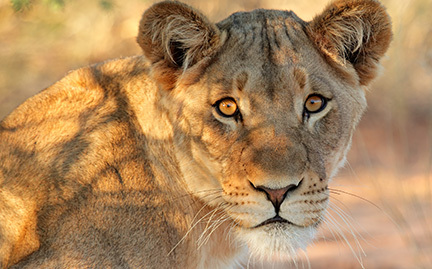 Lions inhabit the plains and savannahs throughout most of sub-Saharan Africa. African lions are the most social of all big cats and live together in groups or “prides.” Females do most of the hunting, and male lions defend the pride’s territory. While lions hunt in packs, individual lions perform the actual kill. Currently, these majestic cats are threatened by habitat loss.